If you know me well at all, you should know that there’s one thing other than gaming that’s near and dear to my heart: hockey and the Detroit Red Wings, equally. I’ve been a fan nearly as long as I’ve been alive and when you give me the chance to mix hockey and video games, I am more than happy to participate. Now, I liked it a little more during the 16-bit and 32-bit generations when there was a great deal more competition when it came to hockey video games, but things have gotten so refined now that it would be hard to do things so differently without being radically different and we all know how people react to that kind of change. 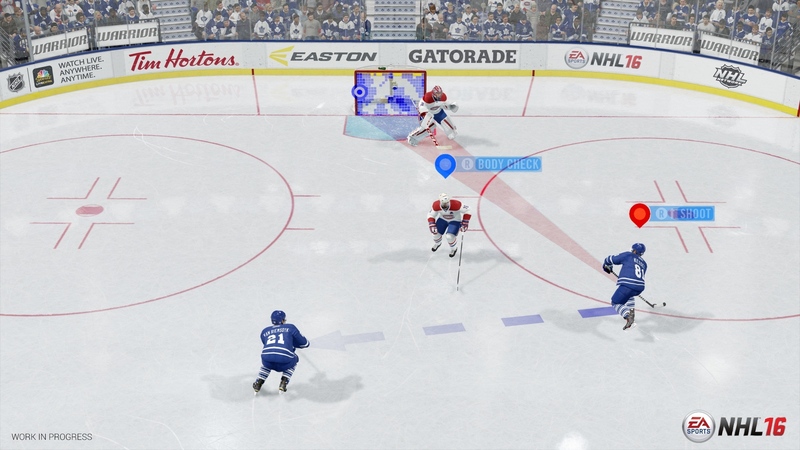 NHL 16 is another step in a long history of hockey games from Electronic Arts that stretches all the way back to 1994 and even further back, depending on who you ask. While you have a game that feels extremely refined and awesome, you also have a game franchise that feels like it’s bordering on stagnancy. Well, it’s that time of year again: a new hockey season starts and that means EA Sports puts out another hockey game. Much like a car that doesn’t get much criticism or a popular cell phone, the tweaks to the mechanics are purely under the hood and improve the performance in small but noticeable ways. Skating still feels smooth and, should you want it, puck and stick contact mechanics have improved to make things extremely realistic in that sense. Physical contact has improved between players quite a bit but when it comes to contact with other variables in the environment like other sticks, the goalies, and the net, there’s still a lot of signs that you’re playing a video game and not watching a real-life hockey game, though that line gets more and more blurred with each release. Still here is the direction that EA is taking in the fact that they want you to believe that this is a sharp television network broadcast of a hockey game. It’s becoming less of a video game and a simulation but rather they’re trying harder in this generation to make it like watching real hockey on television. The announcers are still pretty solid even if there’s a few lines recycled from previous games but it still fits and there’s less of the quirky lines from games in the franchise’s past. There’s a lot of the game that feels marvelous and there’s a lot to the game that just looks and feels silly. Much of that, though, isn’t anything new. Pictured in the image above is, perhaps, one of the best additions to any hockey game in the last ten years: that is called the Visual On-Ice Trainer and it pretty much coaches you as you play and tailors feedback based on your performance and continues to do so. It comes in handy for low-tier players for me who are just out to play the game and enjoy it so we can get better without having to change the difficulty or go online and feel crushing defeat after crushing defeat in order to do so. It’s probably one of the best reasons to pick up this game for the casual player. It also gives you some visual guidance in regards to passing, shooting, and positioning, as well. Things look and sound a heck of a lot better, too, in all honesty. I’m not the kind of guy that cares overly about the graphical presentation so long as it doesn’t get in the way of the core gameplay but last year’s presentation was something of a “one step forward, two steps back” for the presentation of the game and it seemed like EA was getting a feel for what could and couldn’t be done with a game on the current generation. Now that that phase is out of the way, we have a wonderful presentation that feels full and well thought-out. Also back in the game are a few online modes that were really a big deal for a large core of the EA NHL franchise fanbase. They are, for all intents and purposes, more or less the same as they were before they were removed but it’s glad to see the long list of whiners finally quiet down. NHL 16 continues a habit EA is forming among their sports franchise in sharing resources as they’re trying to unify all of their franchise in EA Sports under the same game engine. 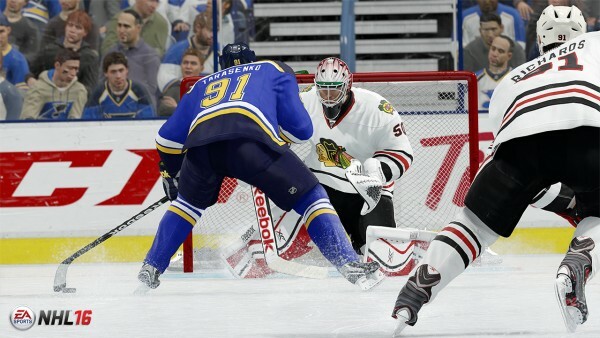 It works but sometimes it feels as though it has its ups and downs: while the addition of elements from Fight Night and Fifa in recent NHL games expanded gameplay physics greatly, it feels as though there was a lot more potential in using that methodology and it could have been refined more specifically for the hockey application in NHL 16. 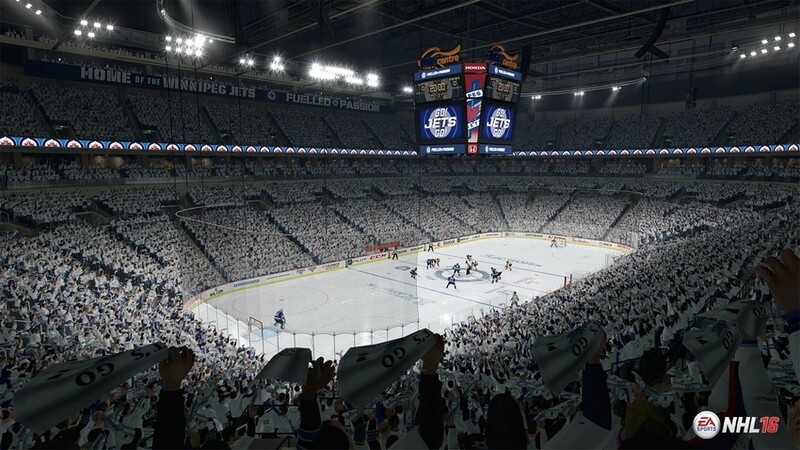 That brings me to one of my biggest concerns with the franchise – with no real competition in the hockey video game world, I feel the franchise may start to stagnate in the near future. I’m always for a little friendly competition and I think it’s necessary to bring out the best in its competitors; without any real threat to their throne in the area, EA has been free to move around as they see fit and I don’t think I like that too much. I think there needs to be someone stepping up and showing us that EA aren’t the only ones who can make a good hockey game. Just… don’t let 2K try it again, please.